Referring to the relationship of money or the involvement of money: Although Sam worked very hard for the farmer, he received pecuniarily small compensation for his efforts. 1. Of or pertaining to legal tender or money: Hank had pecuniary problems and so he couldn't pay his debts. 2. Consisting of or referring to wealth or monetary payments: Mark's creation of the great computer program resulted in his receiving an increase of his salary as a pecuniary reward. 3. With reference to a crime, violation, etc. that involves a financial penalty: There was a pecuniary fine for Jim because he hit a parked car and drove away without getting in touch with the owner. 4. 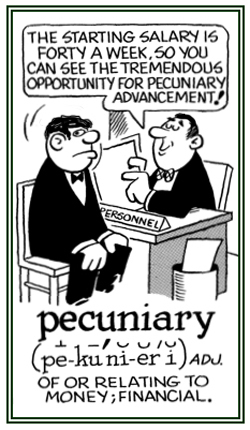 Etymology: from Latin pecuniarius, "of, or pertaining to money"; derivative of pecunia, "property, money"; from pecu(s), "cattle"; derivative of pecu, "flock" or "herd". The historical background of "money" or pecuniary terms. In the nomadic period of Indo-European civilization, before money in precious metal or other compact symbols was thought of, a man's wealth was reckoned in flocks and herds. The Latin "pecus" means "cattle", and the derivative "pecunia" originally meant, "property in cattle". As civilization advanced and wealth was represented by many things other than cattle, the old word was kept with the broader new meaning. When "money" was invented and adopted as a measurement of wealth, the word "pecunia" took on the new meaning of "money". 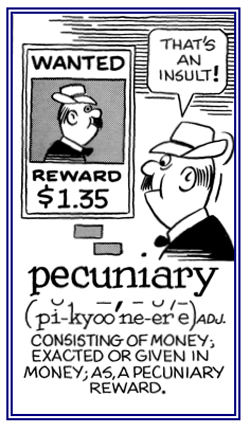 Derived from this was the adjective "pecuniarius", "relating to or consisting of money", from which English gives us pecuniary. Springfield, Massachusetts, U.S.A.; 1933; page 89. A condition in which someone acquires plenty of funds or assets: Bryan's pecuniosity resulted from having a web site that earned him thousands of dollars. Descriptive of being well provided with a great deal of money or being very wealthy: A pecunious man was sharing his wealth with others with the Twitter handle "@HiddenCash" by hiding hard cash throughout the San Francisco area, and then in Los Angeles, where scores of people were on scavenger hunts for hidden envelopes of cash. "Hidden Cash" was a pecunious movement that started on May 22, 2014, and consisted of hiding envelopes filled with money, most often between $50 to $100 in each one, in various parks and was founded by Jason Buzi and Yan Budman using their Twitter account to let people know where to start looking. Hidden Cash’s pecunious creator said his giveaways were a "social experiment for good" and he wrote: "The worldwide interest that has been spawned is tremendous, and though personally surprising, in some ways it is understandable."